Etsy is so dang supportive of us, thanks Tara! Read their post HERE. Love it when there are goodies in my PO BOX like this magazine from Japan with some sort of mention of Handmade Nation.... anyone care to translate? Pretty hyped about this review in Nylon that just came out. Pretty bummed that I am going to save a copy of a magazine with Paris Hilton on the cover. Last night was the official book release party in Milwaukee and it was a huge success! Thanks to everyone who came out and picked up a copy. We would also like to say a big thanks to Cafe Lulu and our sponsor Lake Front Brewery for their support as well as Chris Schulist who played an awful lot of sick jams. Thanks to the ladies who drove from Chicago as well!!!! If you happen to be in our fine city of Milwaukee Cortney and I would love to see you at our book release party Saturday night! Today my interview for Milwaukee Public Radio was on Lake Effect. A big thanks A BIG thanks to Paul over at Lake Effect for doing the interview which aired this morning on WUWM, you can listen to it HERE. I also received my issue of Craft: 09 in the mail that has the very first article I've written for a magazine in it. I wrote about Cream City Ribbon, a local (Milwaukee) company that makes cotton ribbon for the "Green Craft" section. Photographer Kevin Miyazaki (who also happens to be the photographer that took my pictures a few weeks back for my feature in Readymade Magazine) took the beautiful photos that accompany the piece. Last week I had the pleasure of speaking with Alison from Craftcast.com and the interview went live this week! Please check it out HERE. I'm a huge fan of all of Lisa Anne Auerbach's work and this is a piece that I just discovered on her site today. Got on over to Indiefixx.com and read Marie’s review and then leave a comment on this post for your chance to win your very own copy of the book! Winner announced on Indiefixx.com on October 17th at 12 noon. 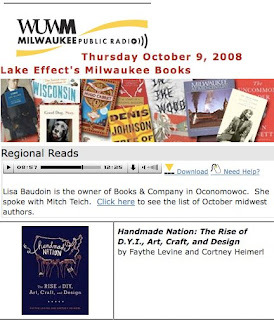 Today Cris (our film editor) texted me to let me know that they were discussing Handmade Nation on WUWM (Milwaukee Public Radio) for their October book list! You can listen to the review HERE, scroll down to the Regional Reads segment, it's at around the 8 minute mark! 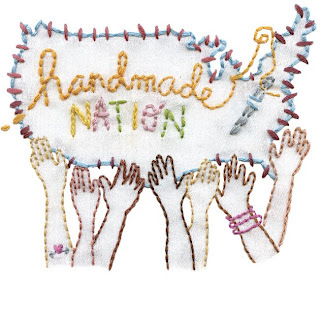 We just found out from our publisher that Handmade Nation the book will be going into its THIRD PRINTING next week! Thanks everyone for the amazing support. More news soon! 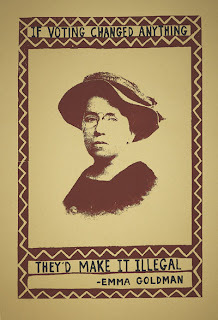 This has been in the works all Summer and I am pleased to say we just put them up on our Etsy.com shop HERE. LIMITED EDITION sheet! 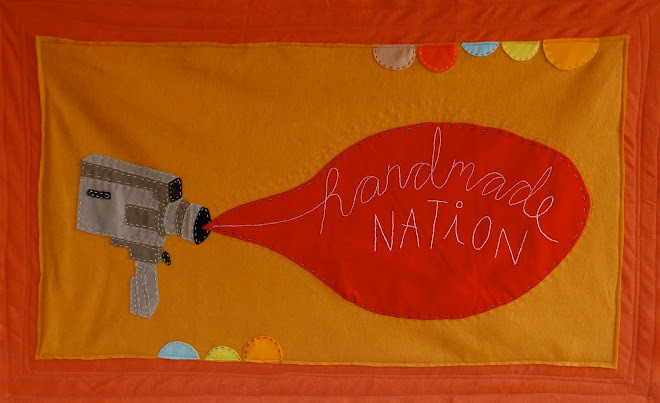 Faythe Levine's Handmade Nation is an upcoming documentary about the DIY movement (a subject we like). This set of desgins by artist Kate Bingaman Burt features movie cameras and her famous, hand-styled typography shouting out all regions of the crafty USofA. For your viewing pleasure..... this is the intro to the feature length documentary (NOTE: on youtube you have the option of watching it in a better quality which looks tons nicer). I blogged about the process HERE. Go to youtube and rate it! !